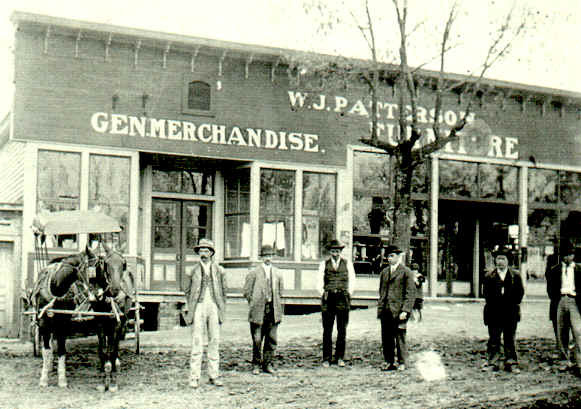 Jarrett Patterson's Store, Church Street in Spray. (left to right) John F. Joyce, Jarrett Patterson, a Mr. Cooper, and three unidentified men...looks kind of like some guys from Gunsmoke, the TV series. 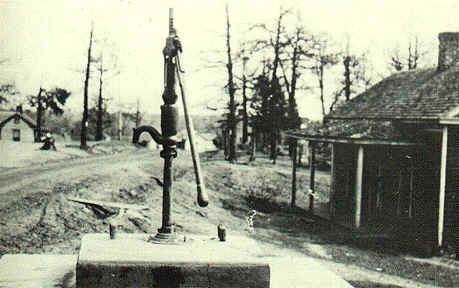 Old community pump in Spray, location now known (read below). My name is Ken Hughes, son of Dewey (Late) and Pearl Hughes of 715 Hampton St. I have lived in Fort Lauderdale for the past nine years, and really enjoy the Leaksville web site. Thank you very much for allowing those of us who are far away to stay in touch with our roots as it were. I know about the pump and recognize the home to the right of it. The reason I know about the pump is from my dad telling me about hauling water from there late on winter nights and pouring it down Church Street to make a sled run the next day. Although the pump is long gone, and the house may be by now as well, I do remember the house and the concrete pad from my early memories. I may be wrong, but I don't think so. Dad lived down the hill and up the road that ran by Taggart Branch. He also wired their home as soon as power was available, and they were one of the first in that area to have power in the home. He said there was a single bulb hanging down in the center of the rooms, which was typical of early wiring practices. He said early on, you had to drive a neutral stake by the home to serve the other side of the power circuit. Later on the power companies ran the neutral wire from their system as the home based neutral stake was not reliable. He told me that when the second wire was added for a system neutral, Pa Hughes said it was a plot by the power company because they were, "Sending the power to the house on one wire, and taking it away on the other." Pa Hughes also insisted that even though a light bulb might be missing from the socket, the switch still had to be off or it would still be running the bill up. Thanks again for a great and informative site.